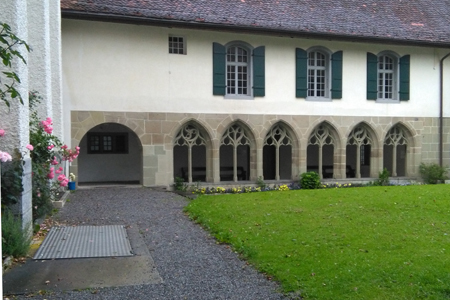 The church meets in the Schlosskapelle, a tiny chapel hidden within a small cloistered area next to the main Swiss Reformed Church. Though it's a small, simple chapel, it manages to be light and airy. Renovations were done in 2003. It is sparsely decorated, with grey walls and a tiny communion table on a raised platform. Founded in 1823, the ICS (quoting from their website) "is an international Church of England mission agency to English-speakers who live, study, work or holiday abroad ... [and an] outreach to tourists ... We also provide seasonal chaplains in holiday resorts in Europe and the Mediterranean ... and have worked in most parts of the world looking after the spiritual and practical needs of people from countless nationalities, backgrounds and economic circumstances." They maintain both a permanent mission in several churches throughout Europe, and a seasonal mission that rotates for several weeks at a time during the tourist season among various locations. In addition to holding services, the seasonal chaplains relate one-on-one to lapsed churchgoers, non-Christians enquiring about the faith, and tourists who find themselves sick or injured, as well as devout Christians. Interlaken, as one might guess, is situated between two lakes: the Brienzersee and the Thunersee. These lakes are overlooked by some moderately sized mountains, including the Harder Kulm and the Augstmatthorn, though not far to the south is the Jungfrau massif, which boasts some higher peaks including the Eiger. The Schlosskapelle is located adjacent to the Swiss Reformed church on the edge of Central Park next to the Catholic church. The service was led by the Revd John Simmons, seasonal chaplain. His wife, Helen Simmons, did the readings. The dozen of us there prevented it from feeling too sparse, but the chapel could easily accommodate 40, perhaps more. As the seasonal ministry primarily serves tourists, the congregation are extremely transient, as one might imagine. The chaplain stood in the cloisters greeting people as they came in. I was welcomed in both French and English, given a handshake, and handed a song book and service sheet. We had small wooden chairs that were quite nice. They weren't spaced terribly far apart, and pushing the empty row in front of me created rather a loud sound as it bumped along the floor. The organ was being played but not too loudly. No one in the church seemed to know one another, but the chaplain did his best to make everyone feel welcome. "Good morning all. Welcome to this Schlosskapelle." We had a small booklet of liturgy that was used as the basis of the service, but it wasn't adhered to strictly. Every time the liturgy said "you" this was changed to "us" and the recital of the Lord's Prayer was moved to after communion. We sang hymns from Mission Praise. Organ, a two-manual nine-register opus of Orgelbau Thomas Wälti, Bern, Switzerland. Throughout the service, I was struck by the chaplain's burgundy coloured corduroy trousers, which looked out of place next to his black, clerical shirt. What wasn't burgundy coloured was the communion wine, which was white  something this worshipper had never seen used in communion before. It was a solid, middle of the road, hymn sandwich, if anything leaning slightly toward the conservative side. It's not the kind of place where you would expect anyone to pray in tongues or wave a flag. 6 – The chaplain is a confident speaker, though he did tend to trot out a fair few cliches that somewhat detracted from the main points of the sermon. Based on Acts 17 (Paul addressing the people at the Areopagus), we were told that we know very little and that as we get older, we know less and less. God is our creator and cannot be served by human hands. God may once have been more patient with ignorant people, but since Jesus, that patience has shortened, so that God doesn't ask for our repentance, he commands it. Despite the small congregation, the singing was very good and it was a pleasure to belt out some classics, including hymns by Charles Wesley and John Newton. During the sermon, the chaplain made an erroneous reference to the chances of the universe being an accident being the same as a tornado going through Wapping and putting together a copy of The Times newspaper. He made multiple references to Richard Dawkins, seemingly as a straw man against which he seemed to advocate young earth creationism. Not the sort of thing one includes in a sermon if credibility is important to you. A young child came running up to me to offer me a chocolate biscuit, which I gratefully took and thanked him for. I then headed out to the cloisters, where coffee was being served, and I spoke to a few people. Not great. That was mainly because it was served in a thin plastic cup, so that to hold it was to burn your hand. That distracted from whatever taste it may have had. N/A – Because it's a seasonal mission, it cannot be a regular church, and even if one were to stay for a season, the minister is rotated every couple of weeks. Burgundy trousers, white wine and a hymn sandwich for tourists on holiday.